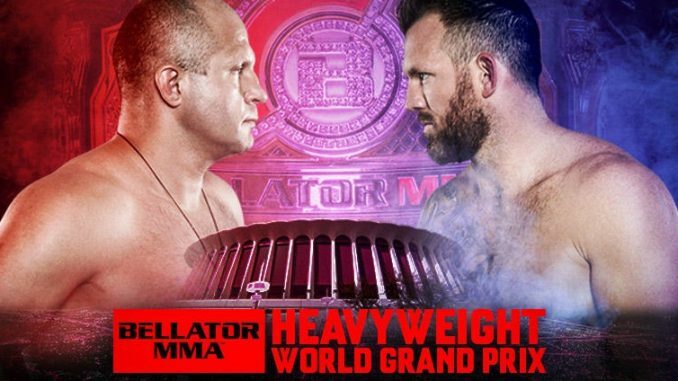 Coverage of the Bellator 214 card from Inglewood with the finals of the Heavyweight Grand Prix between Fedor Emelianenko and Ryan Bader. Welcome to our coverage of Bellator 214 from The Forum in Inglewood, California. Actor Chris Pratt accompanied Altamimi to the cage. Altamimi went for a kimura early and turned to an armbar and got the tap following a brief clinch against the cage. Altamimi mentioned his father is fighting cancer and did this for his father. Archuleta immediately took control from behind. Archuleta entered and was hit with a kick. Archuleta responded with a counter right was showcasing more speed. Archuleta scored a takedown at the end of the round and took it 10-9. Chuck Liddell and Dan Henderson were shown in the crowd. In the second round, Archuleta was shooting and forcing Bandejas to defend his takedown attempts while landing isolated shots. Archuleta got back control while standing but couldn’t take him down. It was a closer round, but I have Archuleta up 20-18. Bandejas rocked Archuleta with a knee strike and was his best strike of the fight so far. Archuleta shot it and slammed Bandejas down. Bandejas landed strikes to the side of the head as Archuleta was trying to take him down against the cage. Bandejas landed a combination and side kick to the body. Bandejas won the round, but I have it 29-28 for Archuleta. This was Archuleta’s 17th straight win and improves to 22-1 and undefeated fighting for Bellator. This was a very good fight involving two notable bantamweights in the promotion. They announced a card for San Jose, California at the SAP Center on April 27th. The card will feature Rory MacDonald fighting Jon Fitch in the Welterweight Grand Prix with MacDonald’s title on the line. The co-feature is Ilima Lei-Macfarlane defending the flyweight title against Veta Arteaga. Ron Killings came out with Hager for his entrance. Hager took Kiser down by the fence and got into half-guard. Hager started landing elbows on top. Hager then applied an arm-triangle choke and got the tap while in Kiser’s half-guard. After the fight, Hager said Bellator would be his life “for the next decade”, which is a long time. Pico dropped him with a right uppercut in the first minute and charged at him. Pico attacked with shots to the body, but Corrales responded with a right hand on the chin that dropped Pico and put him out with several follow-up shots. This was an enormous win for Corrales and his fifth straight in Bellator as he improves to 17-3 in his career. Corrales said he is ready for the title. He fought champion Patricio “Pitbull” Freire in April 2016 with Pitbull submitting Corrales and that his last loss before this current win streak. The audience was electric when the fight began with lots of chants for Emelianenko. Bader dropped him with a lead left, Emelianenko went down. He was done as Bader went to land more on top as referee Mike Beltran stopped the fight.